Americans kill themselves from the food they eat. Heart disease is often blamed on genetics (your mom, dad, grandparents…) BUT over 360,000 Americans manage to kill themselves each year from the food they eat. Cardiovascular disease is the country’s number one killer and coronary artery disease or ischemic heart disease (where plaque-filled arteries literally choke off oxygen to your heart) leads the way. Coronary heart disease accounts for 1 in 7 deaths in the United States per year. But plaque not only builds up in your coronary arteries, it builds up in the vessels of your brain as well. And the result? Your brain shrinks. Unfortunately, the fat-laden, sugar-heavy junk you consume (and find so addictive) often packs on pounds around your middle. Abdominal obesity has been shown to kill brain cells. According to a study published in the Annals of Neurology, having more belly fat is associated with a decrease in total brain volume in middle-aged adults. Lifestyle diseases are diseases that occur primarily as a result of your daily habits. Some of the main contributing factors include: bad food habits, physical inactivity, stress, and an aging biological clock. The connection between type 2 diabetes and Alzheimer’s disease or other forms of dementia are real and strong. Experts are now referring to the progression from type 2 diabetes to Alzheimer’s disease and other forms of dementia to type 3 diabetes or brain diabetes. It occurs when neurons in the brain become unable to respond to insulin which is essential for memory and learning. There is considerable evidence that diabetes is related to brain diseases. Younger diabetics suffer a variety of degenerative diseases earlier and with greater severity than non-diabetics and seem to age more rapidly than normal. People with type 2 diabetes are 50-65% more likely to develop Alzheimer’s disease than people with normal blood sugars. Research shows if you get cardiovascular disease, it is likely to affect your cognitive function. Plaque builds up in your brain as well as your heart. Unhealthy patterns of cholesterol disrupt communication between nerve cells in your brain and contribute to memory and mental destruction. As the population ages, it is expected that dementia incidences will increase 400% in the next 20 years. A 27-year study found obese people were 74% more likely to have dementia, while overweight people were 35% more likely. Possible speculation is that substances such as leptin, a hormone released by visceral or “belly” fat may have some adverse effects on the brain. Leptin plays a role in appetite regulation but also in learning and memory. Lifestyle diseases characterize diseases that occur primarily as a result of a person’s daily habits. Some of the main contributing factors include bad food habits, physical inactivity, stress, and an aging biological clock — all of which contribute to visceral (intra-abdominal) fat. When it comes to your health, where you store your fat makes a difference. Are you shaped like an apple or more like a pear? KRON 4 Morning News Weekend anchor, Marty Gonzalez, and I talk about the difference between the fat that has settled on your hips and thighs versus what you’re carrying upfront. Fat accumulated in the lower body, such as the hips, thighs, and buttocks (the “pear shape”) is subcutaneous fat. Subcutaneous fat lies under your skin and above your muscles — it’s the “pinchable stuff”. Subcutaneous fat is measured by pinching your skin in a several different locations. Your “love handles” are pinchable subcutaneous fat. 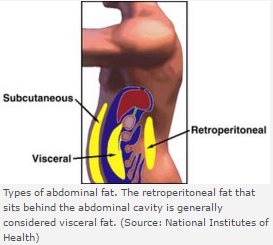 Visceral fat, a.k.a. intra-abdominal, belly, or deep fat, (the “pear shape”) lies out of reach and is tucked deep within your abdominal cavity where it pads the spaces between and around your VISCERA — your internal organs like your heart, lungs, liver, and other organs. It’s also stored in the “omentum” — an apron-like flap of tissue that sits underneath the abdominal muscles and blankets the intestines. As the omentum fills with fat, it gets harder and thicker. Kaiser Permanente of Northern California studied of 6,500 members for an average of 36 years, from they were in their 40’s to 70’s. The study concluded subjects with higher visceral fat had a higher risk of dementia than those with less visceral fat. Possible speculation of the trial is that substances such as leptin, a hormone released by the belly fat, may have some adverse effects on the brain. Leptin plays a role in appetite regulation but also in learning and memory. Researchers are not clear why visceral fat plays a larger role in insulin resistance — which raises risk for diabetes — than other fat. Visceral fat is most dangerous because it is biologically active — that is, it acts like an organ producing hormones and other substances that have harmful effects. For good health, you’ve probably been told to eat more fiber — but all fibers are not alike. If you have risk factors for coronary artery disease and stroke, such as belly fat, diabetes, high cholesterol, or obesity, it’s a good idea to know the difference. Here’s how fiber in general can add years to your life. Fiber is separated into two main types: soluble fiber and insoluble fiber. They’re different in how they react with water — and because of that, they have a different effect on your body. Helps lower LDL cholesterol* (the “bad” cholesterol). Soluble fiber soaks up cholesterol-laden bile in your intestine and eliminates them with other waste. Per a review and analysis of multiple studies, increasing total dietary fiber by just 7 gm a day reduced stroke risk by 7% and heart disease risk by 9%. Example of 7 gm fiber: 1 medium apple + 1/2 cup cooked oatmeal OR 1/2 cup of cooked pinto beans. Slows down digestion which helps control blood sugar and diabetes. Diabetes is a risk factor for heart disease. Helps control body weight by making you feel full longer. It slows the emptying of food through the gastrointestinal tract. Slows visceral fat gain. A study found that eating an additional 10 grams of soluble fiber per day reduced the rate at which visceral fat accumulated (nearly 4% slower over a 5-year period). *LDL cholesterol is needed to produce hormones and provide structure to cell membranes, but because excesses can accumulate in the blood vessels and promote atherosclerosis, it’s been branded as the “bad” cholesterol. Many foods have both soluble AND insoluble fibers with some having predominantly more of one than the other.